I own this shoe and I love it! It’s my “go to” shoe for work as it is super-comfortable for all day wear and it looks great with black slacks and jeans. There are some limitations to this shoe and if you have any “bumps” on the top of your mid-foot area or you have a high instep and tend to get irritation from shoes across the top of your midfoot – this shoe will probably not work for you. 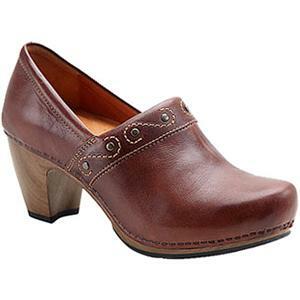 The Dansko Riki has a thick rigid sole that is very protective of the foot, which also makes it very comfortable. It has a wide toebox as well as excellent rearfoot control that allows for more comfort. The Dansko Riki will not accommodate an insert or custom-molded insert but it does not necessarily need one as it has decent arch support built into the shoe. Dansko shoes are not for everyone. Dansko offers pretty hard-core biomechanical control, which works wonders for people who need to be on concrete floors for long hours. Dansko does not tend to work for elderly people who cannot tolerate a “heavy” shoe and it does not accommodate large “bumps” that certain people might have on their feet such as bunions or bone spurs that protrude. I purchased mine from Paradise Valley Mall in Phoenix for $160 and they are worth every cent.